Mom, I’m sorry. I never told you this before, but I never did like Pecan Sandies. In an era now sweetly veiled in nostalgia, when corduroys and cowl neck sweaters ruled the junior high fashion world, and when shiny braces glittered on my buck teeth, I’d pull my partially-mashed lunch bag out of my locker and head to the grim, overly bright lunchroom (teeming with tweens and smelling of sour milk and spaghetti sauce). With hope and trepidation I’d unroll my brown paper lunch bag and peer inside. When I spied those plastic-wrapped sandies sitting at the bottom, my heart sank. I was ever hopeful of seeing my favorites, Mystic Mints (R.I.P. ), or at least their unadorned cousins, Oreos, looking back at me. It’s not your fault, mom. It’s mine. I never told you how I really felt. Turns out, mom was on to something (but then, that shouldn’t have surprised me). She was just 30-some-years too early. Sandies were just too sophisticated for my sugared-out Jolly Rancher and Ho-Hos palate. Buttery, crumbly, not-to-sweet and perfect snuggled alongside a steaming hot cup of tea. I made my version using peanut meal and whole wheat pastry flour. Mom, you’re a genius. Line two baking sheets with parchment paper and preheat the oven to 375F. In a large bowl, whisk together the peanut meal, whole wheat pastry flour and salt. In a small bowl, whisk together the remaining ingredients until well combined. Stir wet ingredients into dry ingredients. Mix in chocolate chips, if using. Form cookie dough into walnut-sized balls and gently press with the flat bottom of a drinking glass that’s been dipped in water. Bake for ~15 minutes, rotating pans halfway through. Remove and let cookies cool on the pans for a few minutes before carefully placing them on wire racks to cool completely. Is it possible for me to love you even more! Lets just say pecan sandies have ALWAYS been my favorite cookie, but alas, I’m not even sure what’s on that ingredient label, I’m sure it has a kajillion unhealthy ingredients, but these my dear, I could really sink my teeth into! I haven’t looked at a Pecan Sandie package in many years – but I’m sure that the ingredient list is horrid! Hah, I hated them as a kid as well. But then, I thought nuts were bland and nasty till I hit adult years. Of course… considering all our ingredients are so much fresher now that might be a reason 😉 As an adult, I love Sandies – just not commercial ones. Love your recipe! Guess we’ve just gotten more sophisticated ;-)! Pecan Sandies, I remember the oily spot they always left from sitting so long on my napkin. It looks like you Peanut Sandies would be a much better snack! I’ve never heard of sandies but what a lovely name. Yours look delicious! It is kind of a nice name, isn’t it, Lorna? And descriptive. Sandy in a good way ;-)! These look great and I am with Lorna – I’ve never heard of a sandie! (Weird I know!) 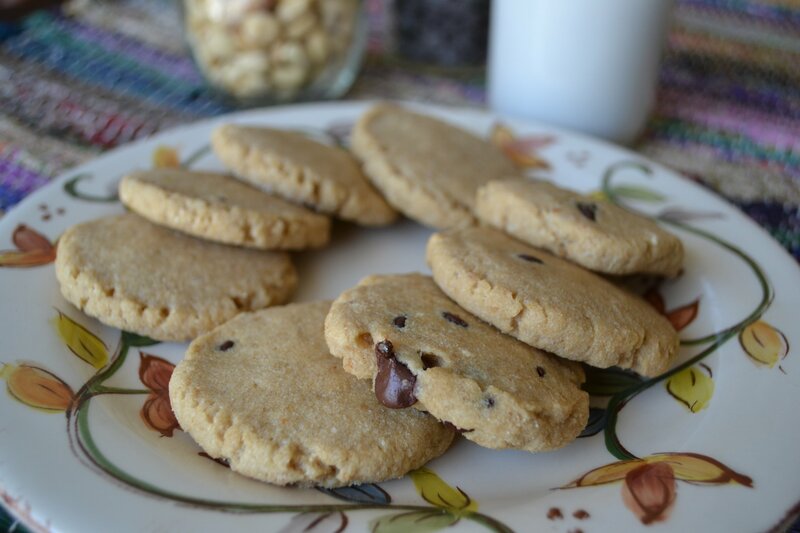 – I love the look of these though – perfect cookies! I would’ve done anything to be able to eat out at lunch ;-)! I can imagine you dreaming up a chocolate sandie, CCU! Yes, that’s exactly right: shortbready. But without the loads of butter. I wish I lacked a sweet tooth, though happily it rages much less than it did even just a few years back. I say this after just finishing up a decadent chocolate cupcake…oh dear. Omg YES! These sound so awesome!! I love traditional sandies, but I love peanuts and peanut butter more. And I love the sound of shortbready cookies minus all the butter!!! You are awesome!! Except what the heck is peanut milk? Can I make it? Yes! You can! And then you can do wonderful things with it! There’s a link in this post about how to do it. Basically…soak peanuts overnight. Blend. Strain. Drink. I don’t think I’ve ever had sandies of any sort. This has got to change because those cookies look so perfect to have right alongside my coffee right now! I wonder what Monsieur Garbanzo could do with the sandie idea ;-)? omg…omg. These look so freaking good. And right when I thought, where in the world do I get peanut meal, you go and link up. So easy! I really want to try making my own nut milk…and meal now. Get after it, girl! So many possibilities!! Also, is maple sugar found easily? Like, at a health food store? Yeah – probably. I’ve seen it at Whole Foods. I’m a snob and get it mail order from a producer near my home town in Ohio – loyalty, you know. You can sub regular sugar. You have inspired me to use the peanut meal that has been languishing in my pantry for far too long! These look amazing! I have never had a pecan sandy, but I imagine I’d like your version better! These look really yummy. Thanks for the recipe.